You may want to discuss with your students how different types of disturbance affect ecosystem structure and how they alter ecosystem functioning. You may also want to discuss the value of old-growth forests; there may be very few (or no) species in this forest that cannot also be found in nearby second-growth forests. So, what is the value of old-growth in this case? 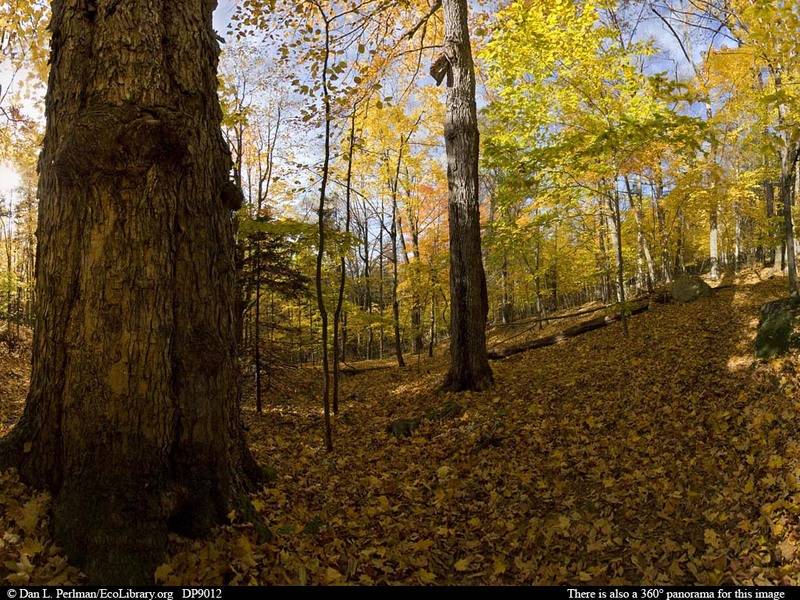 This giant sugar maple is part of 12 acres (5 ha) of old-growth northern hardwoods forest in Vermont, seen here near the peak of autumn color. Very little old-growth forest remains in this part of the country, as most of it was cut in the 18th and 19th centuries. Then, many of the small patches that survived that era were blown down in the massive hurricane of 1938 that devastated towns and forests in much of New England. The Lord's Hill old-growth forest survived because it was in the lee of a hill that protected it from the hurricane's winds.